Home ownership is often seen as one of the largest financial milestones you will make. But for many residents in mobile home communities, while they may own their mobile home, they rent the land underneath their home from an outside landlord. This means they have less control of lot rental increases and less control of their community and their future. But since 2008, ROC USA, a national non-profit, has been helping homeowners purchase and manage their mobile home communities-- empowering the residents and bringing affordable housing to thousands of Americans nationwide. 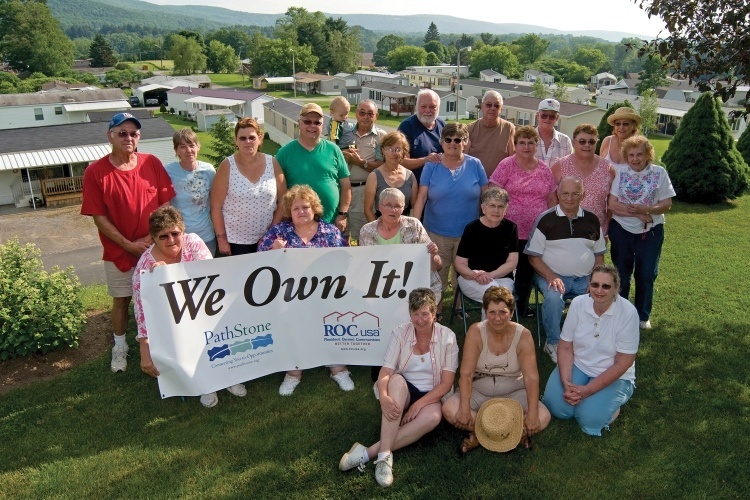 A resident-owned community (ROC) is a neighborhood of manufactured homes that’s owned by the homeowners who live there, not an outside landlord. In a resident-owned community, homeowners collectively form a non-profit cooperative and buy the land underneath of their homes, allowing the residents to become homeowners, not just renters. Residential ownership helps creates stability and empowers the resident-owners to take pride and responsibility in their community. As part of our mission, NCB partners with other co-ops and mission based organizations. In 2015, NCB forged a $40 million partnership with ROC USA Capital and MetLife, one of the largest insurance companies in the world, to finance resident-owned manufactured home communities. The program provided first mortgage acquisition/permanent loans to finance the conversion of resident associations of manufactured home communities to cooperative ownership. As new homeowners, residents develop a sense of pride and ownership in their community, they have greater control and autonomy over their future and they have the ability to improve their neighborhood and control their monthly housing costs, especially useful in areas with rapidly escalating rents. NCB has 40 years of providing capital to housing cooperatives, especially those in low income communities, making NCB a perfect partner to bring a structured loan program to market and help unit owners realize affordable home ownership. Since 2015, NCB has provided more than $13 million in financing to six mobile home communities, helping preserve more than 830 homes.